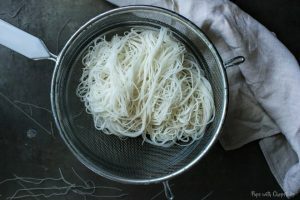 Step by step instructions on how to cook delicate vermicelli without boiling it to get perfectly springy (not mushy) noodles everytime. No more mushy noodles! When it comes to vermicelli, I have made them mushy, hard and goopy. You name it, I have done it. I just follow the packaging and boil it with the time the packaging tells me and the results are always different but more often than not it’s mushy – even when I run cold water through it. I honestly feel like the boiling of the water agitates the delicate noodles too much which can either easily overcook it or just agitate the starches to make it super goopy. 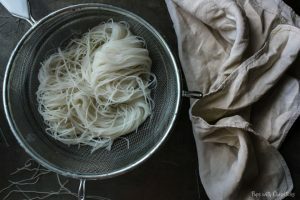 So how do you cook vermicelli noodles and make it right everytime? Soak it! 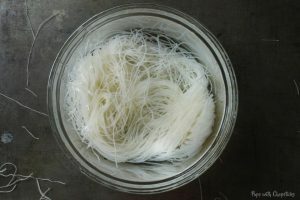 So when I recently came across a technique of soaking vermicelli, I was suuuuuper excited to share this with everyone. The noodles come out just right and springy. You don’t even need to run it under cold water. One thing to note is, vermicelli is never created equal so depending on what brand you buy, they all will require different cooking times. 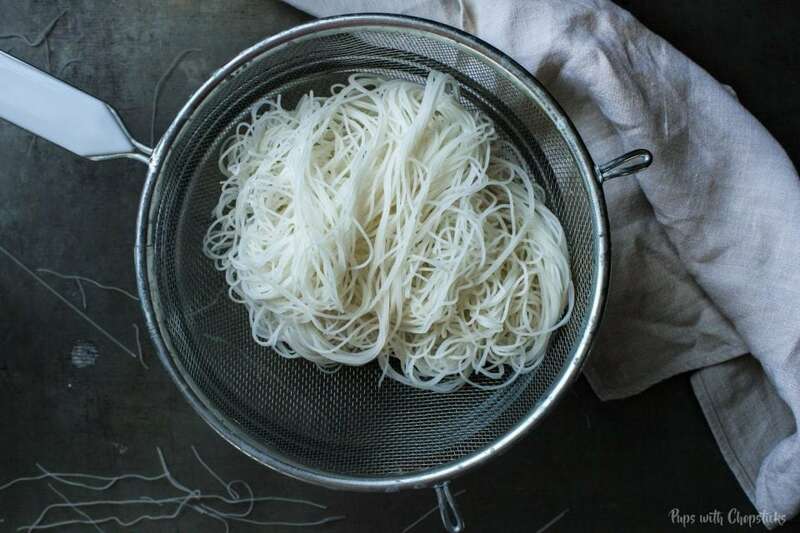 This method will only work on the thinner vermicelli the ones most commonly used in the vermicelli rice salads or stir-fried noodles dishes (some are thicker, almost like a spaghettini or spaghetti thickness, this method will not work on those types of rice noodles). The one on the left is the thin traditional rice vermicelli. 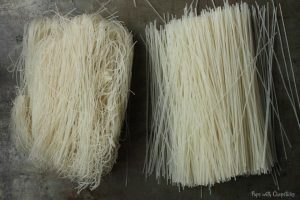 The one on the right is slightly thicker, almost the same thickness as a spaghettini – still vermicelli! The main difference is the thicker one has a bit more of a chew. One of the main reasons why I love this method is that it’s so easy. You don’t need to dirty up a pot and if you’re like me and doing single portions, you can reuse the bowl you soaked the noodles in as your serving bowl as well. First, we get a bowl to fit the noodles in and pour boiling water into it and soak the noodles in it. Make sure to submerge all the noodles with water and cover it with a lid to keep the heat in (We use plates as lids). Soak it for the amount of time the packaging tells you. For us, it was 1-2 minutes. Next, we drain the water out through a strainer or sieve. At this point, you can use it as-is or you can leave the noodles in the strainer or bowl you were soaking them in, just make sure the bottom of the bowl is clear of any water to prevent sogginess. 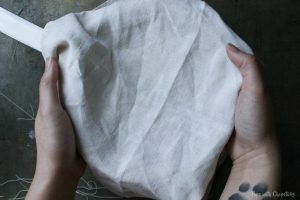 You can take a towel or a cloth and cover it to keep it warm or to prevent it from drying out if you are not ready to use it yet. Once the noodles are soft, you can loosen it up with your fingers and use it! It should have a nice spring to it. You eat it as is, or fry it in a pan for some fried vermicelli! 🙂 You might notice that there are hard bits where the noodle folds when it was dried, those don’t soften easily with just soaking so I just rip out these hard tough bits out and discard it. The Noodles Taste Raw Still, What Gives? Very, very nice! Nothing else to say. I hate mushy rice noodles.